Bandwidth Place is an internet speed test website that's very simple to use and works with both mobile and desktop web browsers. With just once click, you can check the bandwidth of your connection against servers located across four continents. Bandwidth Place will automatically connect to a server that responds with the fastest ping, or you can manually choose one of the around 20 that are available, and then save and share your results. 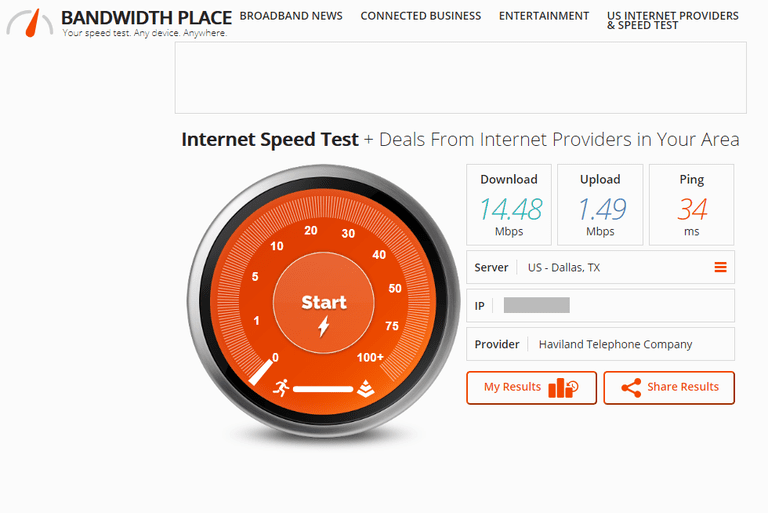 Bandwidth Place is a great website to test your bandwidth if you're only interested in the upload and download speed. Some internet speed test sites let you compare your results with others people in your country or other users of your ISP, but that's not the case with Bandwidth Place. Bandwidth Place is especially helpful if you need to check the bandwidth from a web browser that doesn't support Flash or Java plugins, like from a phone or tablet. Some popular internet speed test sites, like Speedtest.net, require those plugins for the speed test to work, but some web browser don't support them, and some of you may not even have those plugins enabled. Bandwidth Place, like SpeedOf.Me and TestMy.net, uses HTML5 in place of such plugins, which is both more accurate with the test results as well as more versatile when it comes to device compatibility. See my HTML5 vs Flash Internet Speed Tests: Which is Better? for a lot more on this topic. Something we like about more advanced bandwidth testing sites is that you can build a user account to keep track of your past results. This comes in handy in circumstances like if you change the service you have with your ISP, so you can verify that your speeds actually changed. Bandwidth Place doesn't support this, but you are able to save your results offline to an image file, which you can use to track your results over time.